Making your own marshmallows is easier than you’d think! 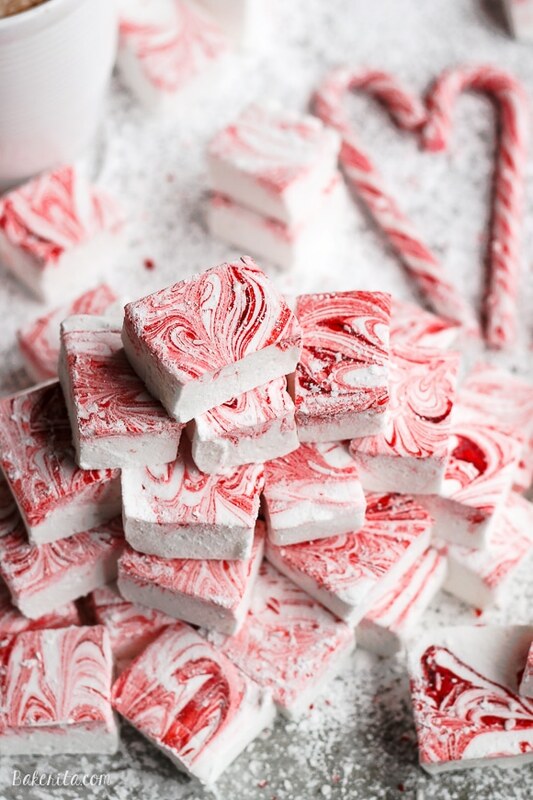 These Peppermint Marshmallows look gorgeous, taste 100x better than store bought, and make a great holiday gift. Be sure to save a few to enjoy in your hot cocoa! Today, we’re making marshmallows. 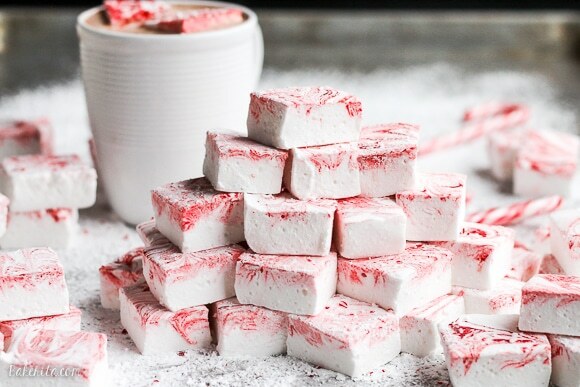 Beautiful, pillowy peppermint-flavored marshmallows that have a gorgeous and vivid red swirl on the top of them. They seem hard to make, right? Most people are surprised by the feat of homemade marshmallows, and even more impressed when they sink their teeth into the sweet, pillowy puffs of goodness that are incomparable to their store-bought counterparts. I tackled homemade marshmallows a while back, and have posted a chocolate malt version and a cake batter version. Every time I make them I wonder why I don’t make them more often. Besides watching for your candy thermometer to reach a certain temperature while you melt down the sugar and waiting a while for the mixture to whip into gorgeous white fluff, this recipe isn’t too difficult. You start by combining powdered gelatin and water – once mixed, you’ll let this sit. It will turn super gelatinous (obviously) while you let it sit. While it sits, prepare the sugar syrup which will eventually get poured into the gelatin. The sugar syrup is just sugar, corn syrup, and water. The corn syrup helps ensure the sugar doesn’t crystallize, and the water helps to make sure the sugar doesn’t burn before it reaches the right temperature. The syrup is left relatively undisturbed once it comes to a boil and a candy thermometer is clipped on. Don’t leave the kitchen though – once the water boils out, the temperature rises quickly. When the sugar syrup is done, the mixture is drizzled into the gelatin in a stand mixer running on high. Let it rip for 10-12 minutes, add your flavoring extracts (peppermint and vanilla, in this case), and pour into the pan. To get those beautiful red swirls, we drop on red food coloring and quickly swirl it in with a toothpick. Let the marshmallows settle for a few hours, or preferable overnight, and then make lots of hot cocoa to enjoy them with! These marshmallows would be good in cocoa, coffee, or dunked in chocolate. You can cut them into whatever cute shapes you want and you have the perfect gift. I’m sort of obsessed with these – don’t be surprised if you see more homemade marshmallows on here! The endless flavors are calling my name. Speaking of lovely gifts, I have an awesome giveaway today to get in the holiday spirit! My blogging friend Annie over at Maebells started the most gorgeous online kitchen and home decor store called Gin Creek Kitchen. I already placed an order and received some beautiful things – two of my favorites are this Copper Cake Server and these Measuring Bowls! She also just added this Burlap Sunflower Wreath that I’m seriously swooning over. Grease an 9×13-inch pan very well, using a paper towel to rub it and make sure you fully coated the bottom, sides and edges of the pan. Set aside. In the bowl of a stand mixer fitted with the whisk attachment, combine the unflavored gelatin and 1/2 cup cold water. Let stand while you make the syrup. Place the sugar, corn syrup and ½ cup water in a medium saucepan and stir gently. Clip a candy thermometer onto the pan, and place it over medium-high heat. Bring it to a boil, checking it occasionally–you are looking for it to eventually hit a temperature of 235-240°F (soft ball stage). Once the syrup reaches 235-240°F, pull it from the heat. Carefully transfer the syrup to a large, heatproof measuring cup or a similar vessel with a spout for easy pouring. Turn the mixer up to medium speed and slowly pour the sugar syrup into the gelatin mixture. When all the syrup has been added, turn the speed to medium-high and let it go for about 10-12 minutes–the mixture should turn white and fluffy. Add the vanilla extract, peppermint extract, and salt and increase the speed to its highest setting for 1 more minute. Pour the marshmallow into the prepared pan and use an offset spatula spritzed with cooking spray to even it out. Working quickly, drop dots of red food coloring across surface of marshmallow. Using a toothpick, swirl food coloring into marshmallow to create a marble effect. Tap the pan on the counter a few time to get rid of air bubbles. Sift powdered sugar evenly and generously over the top. Let sit for about 6 hours or until firm. Use a knife to loosen the marshmallow from the edges of the pan and invert it onto a powdered sugar-dusted work surface. Dust the marshmallow slab with more confectioner’s sugar and cut into whatever size pieces you wish (a pizza cutter works great here). Dip the sticky edges of the marshmallows in more powdered sugar and shake in a sieve to remove excess powdered sugar. Store in an airtight container for up to 1 week. BEAUTIFUL photos!! I love the one of the marshmallows in the cocoa, just stunning!! I have never made homemade marshmallows before but clearly I need to! 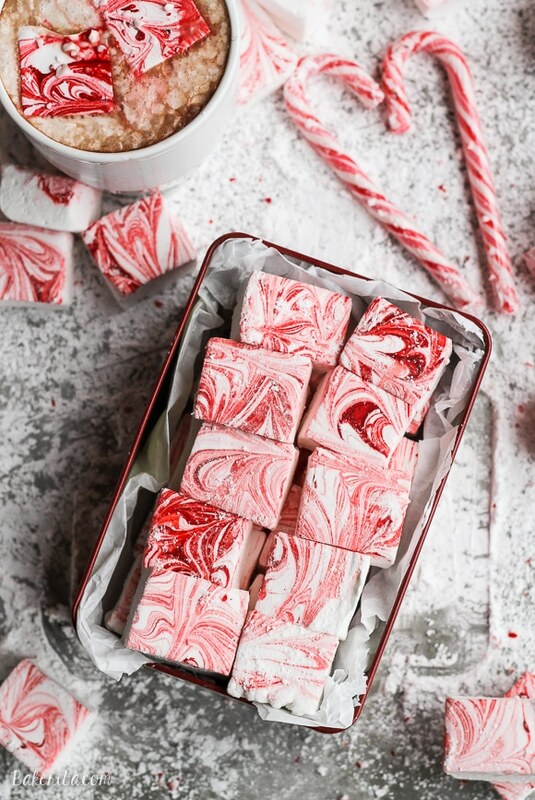 GORGEOUS photos and I totally love these marshmallows! I’ve been dying to try homemade for awhile! These marshmallows are beautiful! I have been afraid to try my hand at homemade marshmallows, but you make it look so easy. Gorgeous! You make it seem so easy and I am super encouraged to try now! Do you have recommendations for a good thermometer? Hi Liz! I actually use a sort of crappy one from the grocery store, and it’s always worked just fine for me! Haha. Here’s a link to a highly rated one on Amazon too :) http://amzn.to/1SOxICt <-- that's an affiliate link! I hope you give it a try :) let me know how it goes if you do. Enjoy! Your homemade marshmallows look so fabulous on top of that cup of hot chocolate! I’ve got to try making marshmallows one day! What a great holiday gift idea, too. I ❤️❤️ Home made marshmallows. So much better than the store bought variety. The cake batter marshmallows sound very interesting!! These are just the prettiest marshmallows I’ve ever seen! I love those red swirls! I still need to buy a candy thermometer but once I have one I’m definitely going to have to try homemade marshmallows, they look just too good to pass up! I love making marshmallows at home! Homemade is actually the only way I’ll eat them! haha These are so pretty with the swirl! Oh oh I have ALWAYS wanted to master homemade marshmallows – yours look incredible! I just LOVE that peppermint swirl. These would make such a great Christmas gift. Pinning everywhere! Love these! I’ve never had homemade marshmallows! I can’t even imagine how delicious they must be. I need to give these a try! Normally I can’t stand marshamllows – my mum used to tell me they were monkey brains but these look so beautiful and inviting. I love the festive red. I have to try making some now. Those marshmallows are seriously SO pretty, I love all the swirls! I need to try making marshmallows again, haven’t in ages! And peppermint is just perfect for hot chocolate. So I have to admit that I don’t like marshmallows, unless it’s in cereal or hot chocolate. But your homemade version sounds delicious and is so gorgeous! I would gladly devour a few of these! I love, love LOVE making homemade marshmallows! 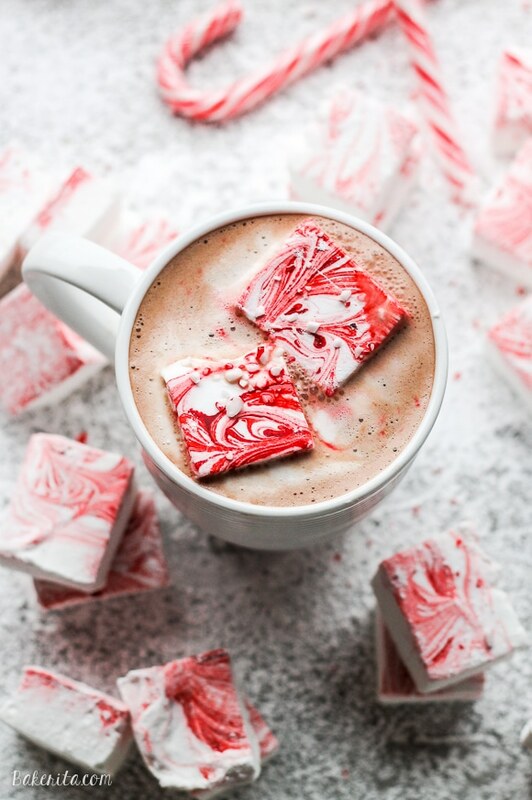 Seriously though, these beauties are SO gorgeous I think I just might have to make peppermint-flavored ones year-round! Did I mention your photography is GORGEOUS, Rachel?? The recipe says a cup of corn syrup but the instructions only use a half cup. Please help in case I missed something. Hi Trina. The instructions were correct – it’s 1 full cup. Thanks for catching that! Amazing Marshmallow recipe. Never will I again buy store bought. Only recipe I’ll ever need. Thanks! Sticky mess — tried this and had trouble getting them out of the pan. Can I line the pan with parchment, lift it out and peel it off instead of relying on the greasing of the pan? Hi Deb – yes, you can do that but I would recommend greasing the parchment. You could also put whole bunch of powdered sugar in an even layer in the bottom of the pan and on top of the marshmallows after you pour them in and even them out to prevent sticking. Do you happen to know how successful making a smaller batch would be? I would love to try these, but with only two of us, a full batch seems like a lot. Thanks for posting this; they look beautiful and sound heavenly! Hi Debbie – you could halve the recipe with success! Just use an 8×8 pan instead of a 9×13 pan. Enjoy! Great! I’ll be trying these very soon. Yummy!! Thanks for a quick response. This is Great news! I’ll be trying these very soon. Yummy! !